YOUR MAMAS NOTES: Last week the long-legged blond at Trulia Luxe Living revealed that handsome soap star turned sci-fi actor Jensen Ackles (Days of Our Lives, Dark Angel, Dawson' Creek, Smallville, Supernatural) and actress Danneel (Harris) Ackles (One Life to Live, One Tree Hill) "sold not one but TWO homes in Los Angeles!" At the time of her report, the long-legged blond didn't have any specific intel on where Mister and Missus Ackles planned to set down their next real estate roots. Thanks to a The Bizzy Boys at Celebrity Address Aerial and a subsequent unequivocal confirmation from our always wickedly well-informed tattletale Lucy Spillerguts Your Mama has learned that in late December (2012), months before they sold either above mentioned house, Mister and Missus Ackles quietly dropped a considerable $4.8 million on a gated mini-estate in the star-studded Point Dume area of Malibu (CA). 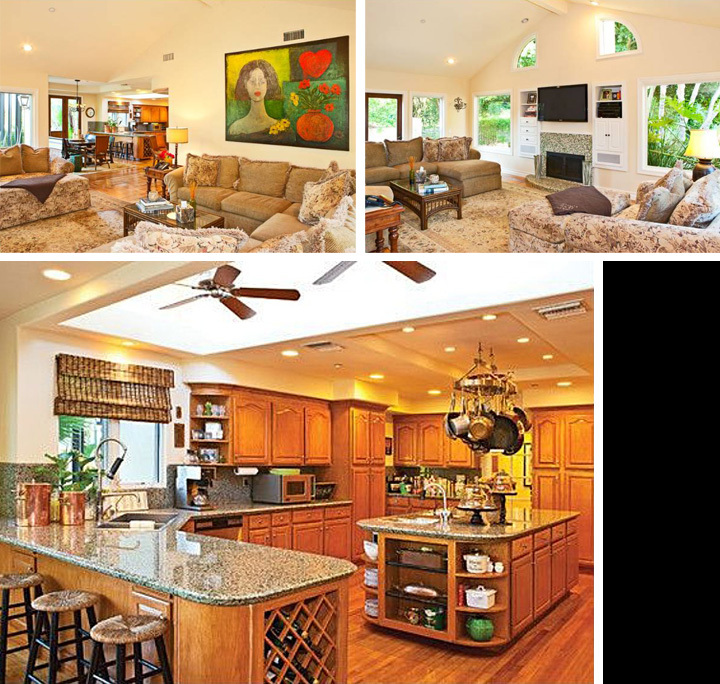 Property records and other online resources show the Ackles' new abode, a two-story mock-Med surrounded by lush tropical foliage, was first hoisted on the open market in mid-2011 with a $5,950,000 price tag. Set well back from the road behind a towering wall of dense foliage and electronic driveway gates on a mostly flat 1.3 acre lot, the house was originally built in 1962 with five bedrooms and six bathrooms in 4,698 square feet. Wide steps lead up from the shady front motor court—there is also a second gated motor court at the rear of the property with garage access—to the front door along to a long colonnade with vine draped exposed beam roof structure. Listing photos show the renovated if stylistically outdated home has a formal living room with stone tile floors, a (probably gas) fireplace, a low looking ceiling and large windows that wrap around the room. We're down with the big windows but we're bothered by their white frames and we're even more perturbed that the window on the right side of the fireplace drops lower that the one on the left. Would it really have been so difficult for the architect or contractor to spec in windows of equal height? Anyways, listing photos show a surprisingly petite formal dining room with wood floors and two walls of wood-framed glass doors with immediate access to the swimming pool terrace. Listen, chickens, nobody likes a glimmering metallic more than Your Mama—just a quick look into our closet will turn up at least a handful of metallic sneakers—but holy moly bat girls and boys the non-celeb sellers had the walls and ceiling painted what appears to Your Mama's boozy and snarky eyeballs to be a rather disturbing metallic copper hue that we can only hope Mister and Missus Ackles had the good decorative sense to paint over immediately. Less formal family quarters include a large center island kitchen with breakfast area and adjoining family room. The kitchen is certainly large and well equipped with plenty of room to whip up a large meal but also has odd rounded corner cabinetry, a couple of ugly ceiling fans mounted into a sky-lit ceiling recess and a cargo van-sized center island over which menacingly looms a pot laden pot rack that looks like it's dying to snag a weave that gets to close or drop a copper pot on a child's head. The adjoining family room has wood floors, a shallow vaulted ceiling and a fireplace surmounted by a flat screen t.v. and flanked by narrow inset cabinetry for stashing media equipment and other family room blah-di-blahs like puzzles and board games. Above the cabinets are a couple of bizarre quarter moon shaped windows that probably provide for an extra bit of light for the room but look, as far as we're concerned, nine kinds of wrong. 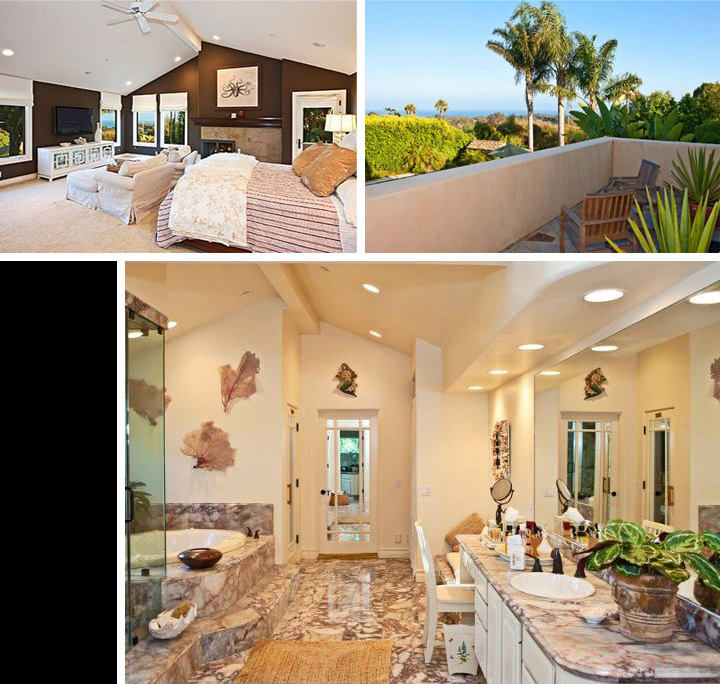 The master suite privately occupies the entire second floor and is complete with fireplace, vaulted ceiling and direct access to a private balcony with—on a clear day—an over-the-tree-tops view of the ocean and Catalina Island. Listing photos from the time of the Ackles' acquisition shows the attached master bathrooms has a built-in hair and make-up vanity, glassed in steam shower, separate soaking tub and is slathered in some sort of marble that looks disturbingly too much like mortadella for Your Mama's personal decorative finish proclivities. Backyard recreation and entertainment spaces include a broad swathe of grass almost the exact size and shape of a tennis court and a smaller lawn at the back where the sellers had a jungle gym and where the soon-to-be new parents will likely install a jungle gym of their own choosing. A U-shaped built in outdoor kitchen/barbecue station has a three stool snack and booze counter and a spacious stone tiled terrace for sunbathing dining and lounging terrace wraps around a bottle green L-shaped swimming pool and spa lined with decorative Spanish tiles. Perhaps one of the best and most coveted attributes of the Ackles' new spread in Da Bu is the deeded "beach key" access to Little Dume, probably the most exclusive of the quartet of private Point Dume beaches that's overlooked by swanky abodes owned by Tinseltown luminaries such as semi-reclusive movie star Julia Roberts and saxophonist Kenny G. A short list of other notable Show Biz types who have beach key access to Little Dume include Matthew McConaughey and Camila Alves, Pink and Carey Hart, and billionaire film producer Sydney Kimmel who, backin early 2007, paid around $38 million for the multi-lot bluff-top compound of the late late night talk show legend Johnny Carson. 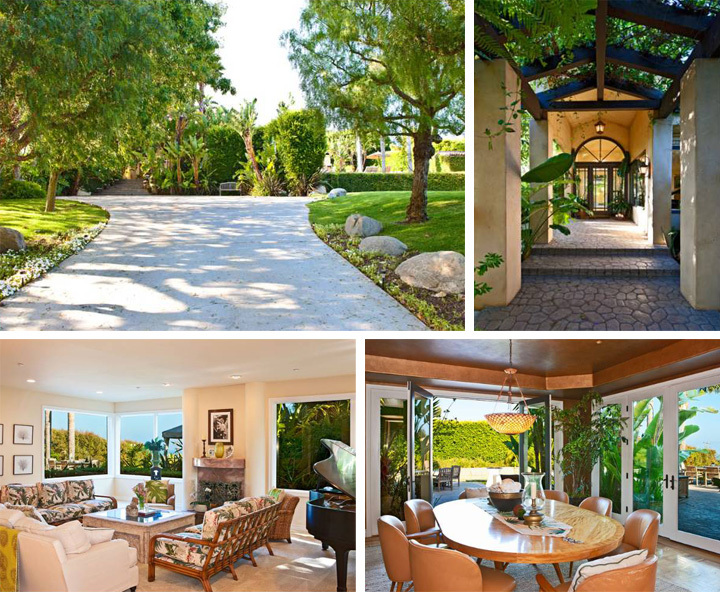 *Property records show Mister Ackles picked up the property a decade earlier for $645,000. **Property records show Mister Ackles purchased the property in September 2009 for $2,435,000. I like how you said "Who"
but if he is ok, it`s ok! Jeff Gordon..30M listing in NY? Seems like Mama hit the nail on the critical head -- repeatedly. "...the attached master bathrooms has a built-in hair and make-up vanity, glassed in steam shower, separate soaking tub and is slathered in some sort of marble that looks disturbingly too much like mortadella for Your Mama's personal decorative finish proclivities." Most of SPN fandom knew about all of this months ago when the house popped up under one of his Trusts he has in Dallas, TX. It's a nice house. Jensen has stated they are already doing a major renovation on the house that started with the kitchen. I'd buy it if Jensen came with it. Preferably in the shower or mowing the lawn shirtless. He's so young and already so accomplished. Kudos, he and Missus deserves everything they have. Did I read right: No home left near the studios? PCH plus distance in general to studios when your tired, from a guy I know on same street, means a lot of sleep overs in the dressing room. Hope I'm wrong. Pretty area though. And right Mama, if you can steel a sliver of the ocean up there it's a plus. I was ready to go off on windows, too, even before heading down to your smarm-atorial, sweet girl -- cause I'm a window-manic. The little ones three off the floor are irksome. Listing says they’re upgraded, meaning it was a conscience decision. Just takes saws-all and few extra pennies for tempered glass. Hauhh. In the end, good public school and even though Malibu is more nuts than ever, great place to raise a family. Typo ... three feet off the floor. I don't think the living room windows have different sill heights. After looking at the ceilings, the windows on the left appear to be further out - meaning a slightly projecting corner. Not saying that it's ideal. Just saying the cause is not what it appears. That Danielle (or however she spells her name) is one lucky lady. This is so effing irrespectful. Those are people they deserve PRIVACY. The only thing irrespectful around here is your grammar. No need for Jensen to have a home near the studioes because Supernatural is filmed in Vancouver, B.C. Jensen only commutes home on the weekends from Canada during filming season. @7:06 Filming in Canada can't last forever. I've been wondering for a while who bought this house . . . it seems i have new neighbors, or almost neighbors. I've never heard of him before but he's exactly my age. Welcome to Malibu, Mr. Ankles. Never heard of them peeps before, and that house is ugly. Kinda' small and cheapish for movie stars. DELETE these pics! They don't want it!!!!! You don't have any respect!!!! What is with those quarter-circle windows floating in the Family Room? They have no relationship to either the roofline or the vertical elements. Drives me nuts. All that money and somebody thought it would be genius to just toss those into the mix. And if you're gonna paint your walls a statement color (ala the boudoir) please don't forget about doing something to the ceiling. It looks like you couldn't afford that extra $40 can of paint. The vaulted white ceiling sticks out like a sore thumb. And that kitchen looks like my old suburban Atlanta kitchen. Nice, but well... Yawn. Gosh I love it, how some fans are getting an "Show him some respect, Take this down." attack, because of this. Jensen is an actor, he has to live with such things like this. (and sorry for the english, it´s not my native language). I am a Supernatural and Jensen fan but some of you all need to chill out! Yes Jensen is a private person and doesn't want his address blasted all over the place. Guess what? His address isn't listed and even if it was, this is PUBLIC information from property transfers. As a fan you can gripe about other fans violating Jensen's wishes but you can't tell someone what they can post on their own blog! Stars homes are listed all over LA, the tours make millions a year! Saying the Ackles have moved to a certain area is not a big freaking deal. I wouldn't publicly link to this info on my pages but threats and ranting at Mama? INSANE! She can keep the house after the divorce..lol!! those windows that are popping out and catches your eye, reminds me of the amityville horror windows. its quite creepy... but i guess alot of windows at different angles and shapes and sizes brings in more light. thou i dont get why they need so many windows, its california, its always so bright out. i hope they dont overboard on the lights like in the last house. Why do people get all heated about privacy and being 'disrespectful'? These are only real estate pictures of a house for sale available in the public domain like any house. Do you really think the new parents won't put their own mark on it and make it look completely different? Jensen seems to be level-headed and relatively down-to-earth and I'll bet he doesn't mind a bit. He probably realises this is the price of fame. What he doesn't need is a bunch of Rottweilers thinking they need to protect him. He'll just call Sam and Dean! OK if you decide to become a public figure or actor you have to realize people will want to know about your life. If he loves his privacy so much he should have stayed in Texas and worked as a sports physical therapist like he said he was going to do before he changed his mind to go to hollyweird.